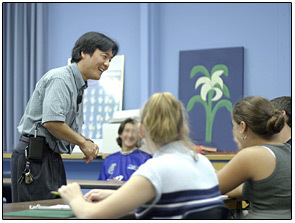 Naoto Kobayashi started Maine's first and only Japanese program in Maine. In third grade at Hall-Dale Elementary School, everyoneâ€™s favorite class was Japanese. It was the class where we sang the most, where we thumped our fists against each otherâ€™s backs when we learned Japanese massage, and where our teacher, Naoto Kobayashi, told us stories, which sounded to us like fairy tales, about Japan. Once, during a monsoon, he had had to swim out of his house to escape the water flooding in. He did giant breast strokes through the air to show us. Another time, he had a chocolate party in a Japanese temple. Kobayashi Sensei, as we knew him, meaning “Mr. Kobayashi” in Japanese, was from a rural island in Japan, the name of which no one could remember. He was one of many siblings, and he immigrated to the United States after meeting his wife, Betsy, an American woman, in Japan. Somewhere in the process he became an American citizen, they settled in Maine and he started teaching Japanese in my elementary school a few years before I started third grade. We lived in a place where houses were set back from the road and where our local paper ran stories about how the rain was affecting the strawberry season. Kobayashi Sensei was one of five people with Asian heritage in my elementary school, and he was the only person in the building with an accent. He never expressed to us, as inattentive third graders, what that felt like. The most we knew about his cultural transition was his difficulty distinguishing “r” and “l” sounds, as when he accidentally asked someone at the grocery store where he could find lice.In central Maine, we did not meet a lot of people from other cultures. At Hall-Dale Elementary School, however, we grew up on Japanese. Every year we relearned the names of the foods and animals, sang the elephant song and learned to drum. It wasnâ€™t until middle school, when we were finally allowed to choose what language to take and half of us had already decided to study Spanish or French, that we began to understand what he had brought to our school. Ours was the first and only Japanese program in the state, and he began teaching in front of a video camera so that it could be broadcast to other schools. He started coordinating a student exchange between our school and a high school in Japan, and every other year we filed into the gym to watch twenty petrified Japanese students introduce themselves. It was one of the few events in which the administration broke out the microphone. Sometimes on the â€œLocalâ€ page of the county newspaper next to phrases like â€œsuccess storyâ€ or â€œcultural exchange,â€ there would be pictures of him teaching us, and our parents would cut out the picture so we could look to see if any of our friends were in it. Once we missed third period to watch a woman in a suit give Kobayashi Sensei an award. As nine year olds, we had come to embrace him as a celebrity and giggled when he walked past us in the hallway. There were fairy tales about Japan, however, that Kobayashi Sensei didnâ€™t tell us, but which came out later. About a century ago, Kobayashi Senseiâ€™s great-grandfather, Takuji, came to the United States. Takuji graduated from the University of Washingtonâ€™s law school, passed the state bar exam with honors and was then denied the right to practice law. He brought the case to the state supreme court, but did not qualify as a â€œfree white personâ€ and thus could not become a naturalized American citizen. After the Japanese bombed Pearl Harbor, Takuji and his wife were forced into internment camps. When they emerged three years later, they had lost everything. They went back to Japan, and Takuji never practiced law. In 2001, the Washington state Supreme Court posthumously admitted Takuji to the state bar. Naoto Kobayashi flew out to the ceremony along with the rest of his family. Back at Hall-Dale Elementary School, we had a substitute in Japanese class.